The most common cancer caused by alcohol in the United States is breast cancer. Research shows that alcohol affects women more than men when it comes to cancer. Figure 1: Comparison of Cancer Risk for Alcohol and Cigarettes. 1 Bottle of wine per week equals 5 cigarettes per week in men and 10 cigarettes per week in women. Most people know of the strong link between smoking and cancer. Decades of public health campaigns have taught us that smoking causes lung cancer. However, fewer people know of the link between alcohol and cancer. The US Department of Health and Human Services lists alcohol as a known human carcinogen. This means that scientists believe alcohol causes cancer, similar to smoking and asbestos. In order to put the risk of cancer and drinking into the context of smoking, which is better known, researchers in the UK have compared the risk of cancer from a weekly bottle of wine with cigarette smoking. Based on data compiled from multiple studies, researchers estimate that for men, 1 weekly bottle of wine has a similar risk of cancer as smoking 5 cigarettes a week. This is also roughly equivalent to drinking 4 pints of beer. For women, one bottle of wine a week has about the same cancer risk as smoking 10 cigarettes per week. 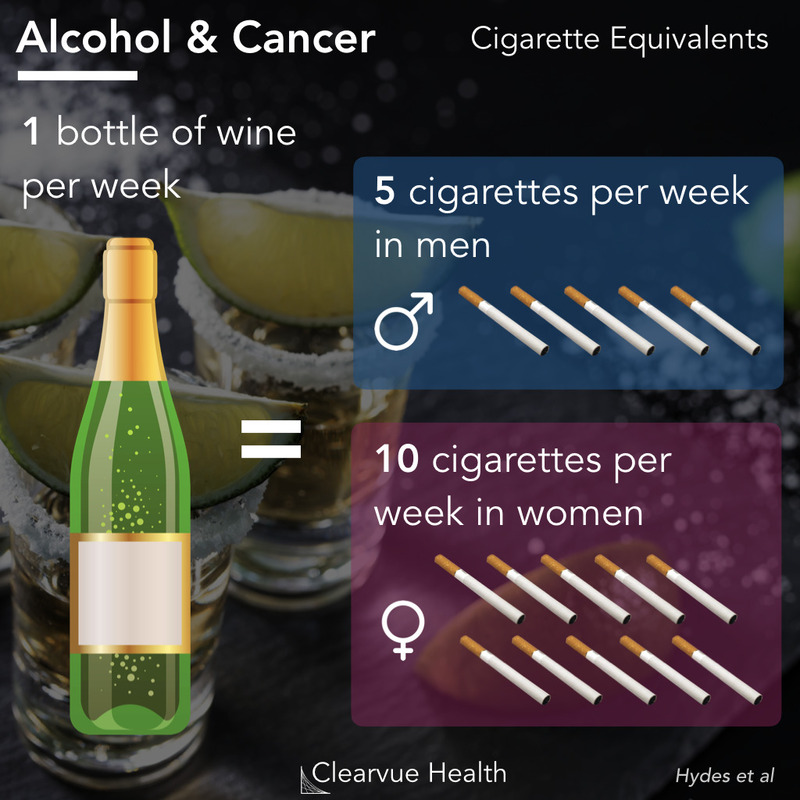 Source: A comparison of gender-linked population cancer risks between alcohol and tobacco: how many cigarettes are there in a bottle of wine? Figure 2: Hospital Admissions for Cancer in the UK. This metric approximates the number of cancer cases in men and women. Despite drinking far less than men, women have similar numbers of cancer cases per year in the UK. Of note, this is not the same as mortality as it covers all patients who get admitted to the hospital for cancer whether they pass away or survive. The chart above was created based on the dataset used by researchers to estimate the cancer risk of alcohol. 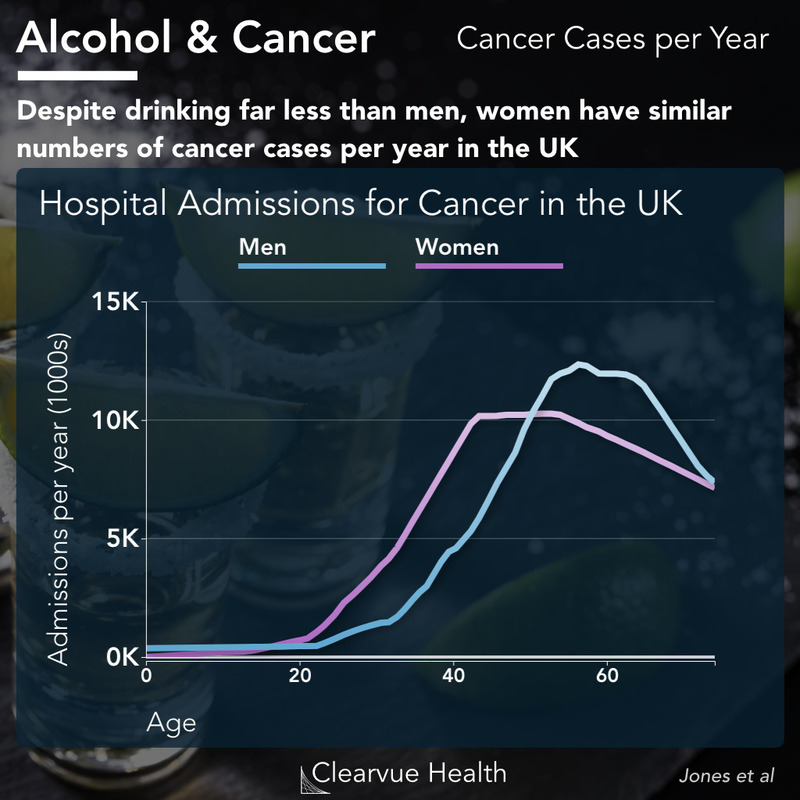 This dataset shows that while women drink much less than men, they both have similar rates of cancer, as measured by hospital admissions for alcohol related cancers. This suggests that women are more susceptible to getting cancer from alcohol on a per-drink basis. Additionally, it is interesting to note that your risk of getting cancer from alcohol appears to go up dramatically with age. While many associate binge drinking with college or parties in their 20s, most cases of alcohol-related cancers don't come until your 50s and 60s. Figure 3: An estimated number of cancer deaths per year attributable to alcohol. Researchers estimate that over 21,000 Americans die every year from alcohol-related cancers. The most common type is believed to be breast cancer. Followed by Colon, Esophageal, and Liver Cancers. In a study from the United States, researchers estimated that alcohol leads to over 21,000 cancer deaths per year in the United States. Among these deaths, the most common type of cancer is in fact breast cancer, with over 7000 deaths per year in women. 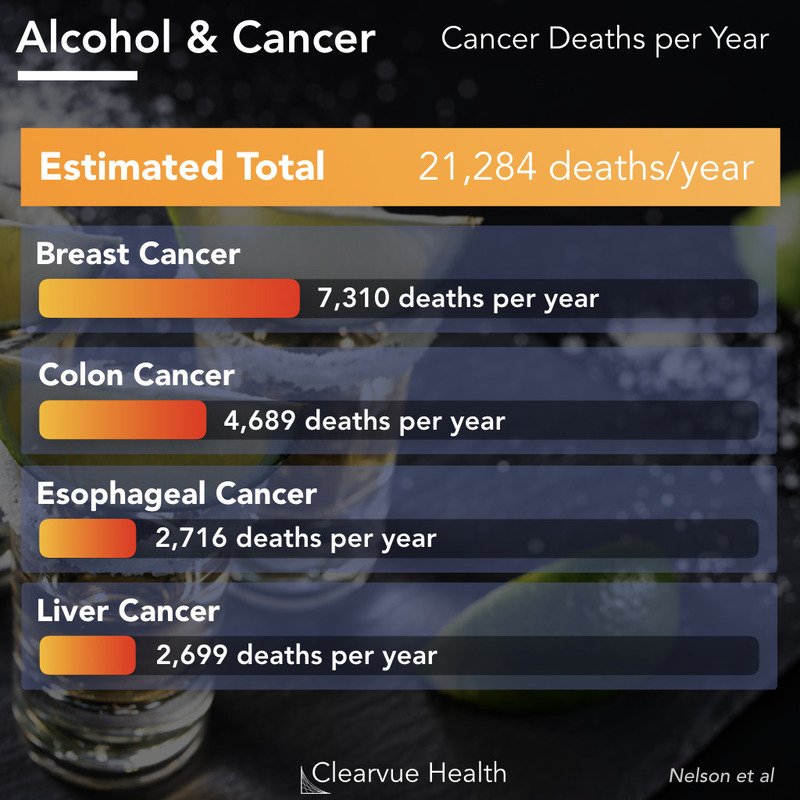 While this data is an estimate generated from observational data, it does suggest that much of the added cancer risk from drinking comes from breast cancer. Binge drinking can be just as dangerous as smoking when it comes to cancer. The other aspect of this study to note is that the data above only covers cancer. Both drinking and smoking cause many deaths from many non-cancer causes. For example, alcohol leads to many deaths from liver failure and car accidents. Smoking leads to many deaths from heart disease. In presenting this data, our goal is not to advocate for complete abstinence. We believe that drinking and smoking are personal decisions everyone should make for themselves. However, like any other key decision, we believe better decisions come from better information. Soda has been similarly linked to cancer risk. Drinking more than 2 sugary drinks a week correlates with a significantly higher risk of cancer.